In the beginning of 2017, Porinju Veliyath tweeted that the discount on holding companies will come down to 50% and many such holding co’s will give 100% returns. Since then extensive media & analyst community coverage meant that the discounts did come down and most of the holding companies gave fantastic returns in a short span of time. Now, holding companies always trade at a discount to the NAV of their investments due a variety of reasons ranging from reporting of consolidated statements to illiquidity of investments. Now if Tata Investment Corp decides to sell all their holdings in Tata group co’s, the share prices will surely fall and further more holding companies tend to hold their stakes well into eternity. 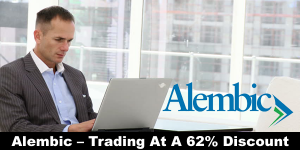 Lets look at a company Alembic Ltd. which is trading at a discount to the market value of investments it holds. The total market value of holdings is Rs 2,751 Crores while the market cap of Alembic Limited as on 27 September, 2017 is Rs 1,036 Crores. Lets dig in deeper now. Note: Reported numbers as per FY17 Balance Sheet. Just the value of Alembic Pharma shares is Rs 2,751 Crores and the market cap is at a 62% discount to this value. Holding companies usually trade at a discount to the market value of their investments and this discount at times is usually more than 50%. Often, the deep discount sustains for many years. In most cases, you are better off investing in the underlying company if you are bullish on its prospects. In Alembic Ltd’s case, the discount of 64% has scope of narrowing down to 50% over the next few quarters (8-10 quarters). Investors should note that Alembic Pharma’s share price is trending lower, having fallen from Rs 700 per share to Rs 500 per share over the last one year. In the same time, Alembic Ltd’s share has remained flat on a YoY basis thereby narrowing the discount. Investing in Alembic Limited should be subject to your own research on the long term prospects of Alembic Pharma. However, there is a decent margin of safety coupled with a decent risk reward ratio which makes it a good medium term investment.